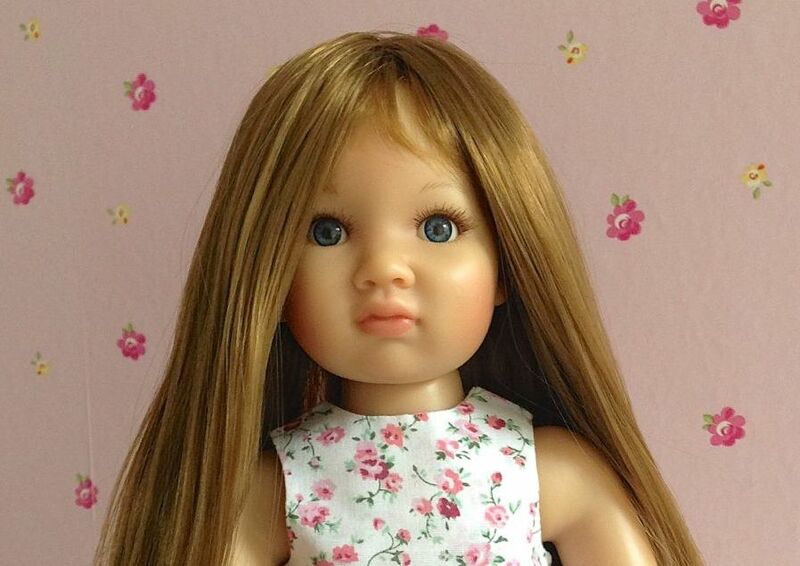 My daughter’s Kidz ‘n’ Cats doll, Mareike, needed a new wig. Mareike’s hair had been getting frizzier and frizzier and I had tried everything. We washed it, we used hair cream, we used a wire brush to reduce static, but nothing improved it. The last straw was taking Mareike on holiday to Portugal and having her on the beach with us in very hot sun. Her hair turned into frizzy wire. Recently, I attempted to improve it by following the same instructions I had used successfully to restore my Sasha dolls hair. Disaster struck – it could not get any worse, so I removed the wig completely. Rosie was distraught and very angry with me that I asked Kidz ‘n’ Cats for a new wig. Mareike is no longer available so Rosie chose Galina’s wig, as the hair colour is the same as her own. Here is poor old Mareike, very embarassed by her lack of hair! The wig arrived and I have to admit to quite a lot of procrastination! I haven’t ever attempted to completely replace a wig before. I have given them haircuts and repaired slight problems – but sticking one on! Definitely one to put off for as long as possible! 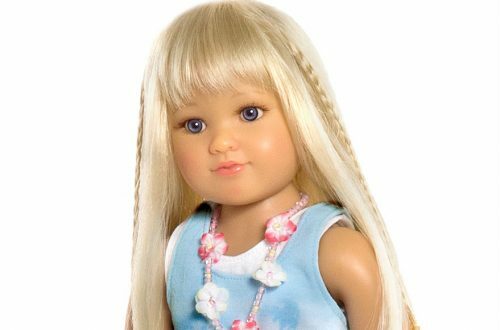 This week I have been trying dolls clothes on all the various dolls we have and I kept seeing poor Mareike, bald and in a mess, so decided to just get on with it so that Rosie could have her favourite doll back. I really wasn’t sure what sort of glue to get but knew I would need to move the wig around so an instant setting glue wouldn’t work. I selected Evo-Stik Serious Glue. It’s a clear glue that takes a couple of hours to dry (so the wig could be moved around a bit) and can be used for most plastics including vinyl. 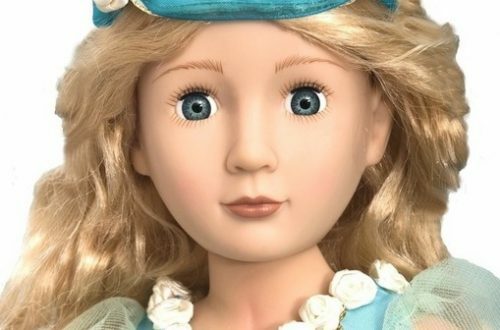 Since writing this post, Mike from Ellie’s Doll Workshop told me that Aleene’s Tacky Glue is the one to use, because it takes a while to set so the wig can be moved around, but also it can be easily picked out of the hair if accidents occur. The picture above shows the mess on Mareike’s scalp – loads of old glue that would need to be removed. If I left it on I thought it could interfere with the new glue setting correctly so I set about removing it using White Spirit. As you can see it worked pretty well and Mareike looked much better even with no hair! I gave Mareike’s scalp a wash with detergent to remove all traces of White Spirit. This is the first time I have seen a doll without hair and had no idea that the head would have a great big hole in it. I had always imagined that eyes would be inserted from the neck, but clearly they are done from the top of the head. Before gluing on the wig I tried it on Mareike to get an idea of where it should sit. This was actually quite tricky because the weight of the wig pulled it backwards all the time but I got a feeling for where it would need to be positioned. Then I prepared the wig. I tied the hair into a ponytail and clipped the fringe onto the top of the wig. This was all intended to keep it out of the way of the glue. Next time I do this I will complete the next step before tying the hair into a pony tail because there was quite a lot of bulging hair around the edge of the wig which got in the way. Then I turned the wig inside out and practiced putting it on Mareike’s head before doing it for real with some glue. The next photograph I took showed where I put the glue but it has vanished!! I didn’t put on too much glue but started in the centre of the inserted grey ‘cap’ area curling around in spirals about 1/4″ apart to cover most of the head. Don’t go mad here as more glue can be added around the edge later if needed and pulling the wig into place will also spread the glue. Excess glue can also seep through the wig mesh and into the hair. Pop the wig on carefully ensuring that none of the hair goes into the glue. I managed to get several large strands under the wig but was able to pull them out. They were a bit glue covered but I let it dry and was able to comb out all the bits later on. You need to gently pull on the edges of the wig to ensure that all the layers are fully stretched out and the net lies flat against the head. Keep checking the alignment of the wig compared to the ears and forehead. Make it as even as you can. If you have large areas that clearly don’t have enough glue then you can carefully add some more. This took me a while but I was really happy with the end result. If it is just the edges that aren’t quite down leave them for now and use some superglue when the other has dried thoroughly. The Serious Glue had done quite a good job. All of the net seemed to be secure but where the last layer of hair is attached to the net could clearly be seen. I didn’t want to see the net at all and felt it could start to come off easily if the edges weren’t really well glued down. This is where my favourite little bottle of Loctite Super Glue came out. It’s a very small bottle with a tiny brush applicator which means that you can be really accurate with where you put the glue and can easily control the amount of glue applied. I literally just spread some glue over the very outer edge of the wig, pressed it down and the finish was perfect. I did this all around the wig and the result was great. And what did Rosie think of Mareike’s new hair? Well, she loved it and thought it suited Mareike better than her old blonde hair. I have to agree. I just hope that Mareike can cope with having her hair looked after now as there is so much of it – or it will be a trip to the hairdresser for a short bob! First posted to Petalina’s blog on 19/5/13.